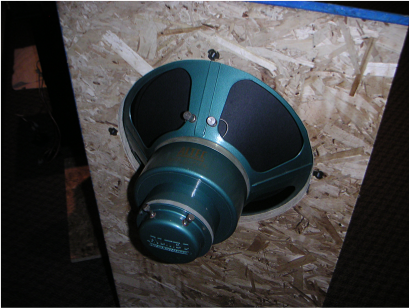 The Altec duplexes were the 605A ALNICO 15" with mock sectorial horn (stock originals circa 1962) with a simple 4 component (2nd order electrical) crossover on a simple Open Baffle. 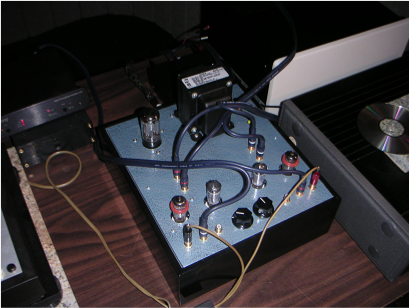 Used a Musical Fidelity A308 SS Integrated amp (good for about 200 wpc at 8 Ohms) and the Ah! 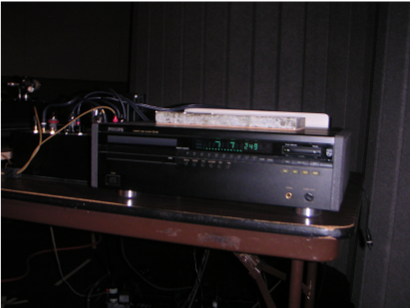 Tjoeb CD player which is basically a hot rodded Marantz chassis with a vacuum tube out put stage. The Tang Band W6-1138SC 6-1/2" woofers did double duty providing the bottom end below about 90 hz for the 605's. 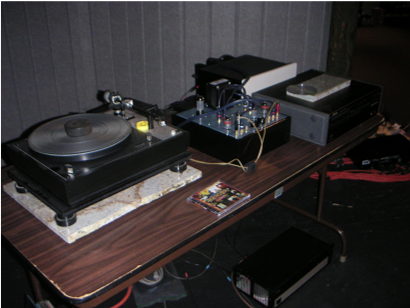 When used to support the 605's, I drove the TB's with a Madisound Kega 150 watt plate amp and operated them in parallel for a mono summation. 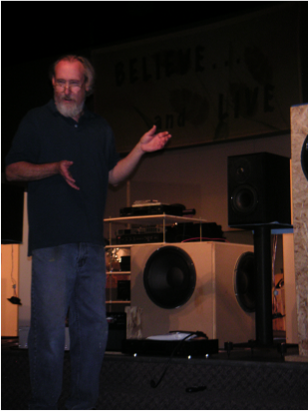 John Busch showed off two systems - An Altec "Voice of the Theater" high-efficiency horn/woofer coax and a small 2-way Tang-Band system with impressive low output. 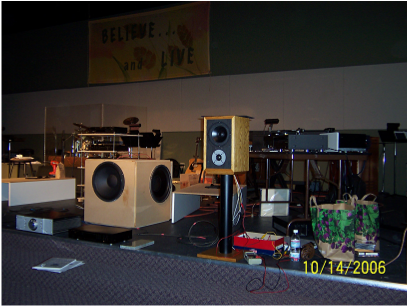 In the full range mode, the TB's used the Scan Speak 1.5" model 8200 mid-tweeter and the Tang Band W6-1138SC 6-1/2" woofer. The cross over was 4th order electrical at approximately 900 hz. The TB boxes were $12.50 buy outs from PE and normally used for the BR-1 and are about 14 liters net. 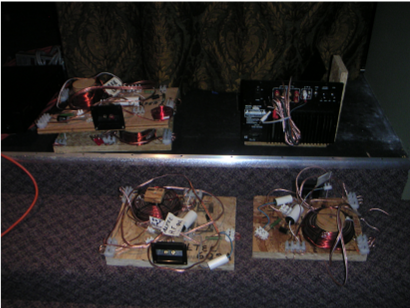 They were tuned to 37 hz via the stock BR-1 (1-1/2" X 8" port). 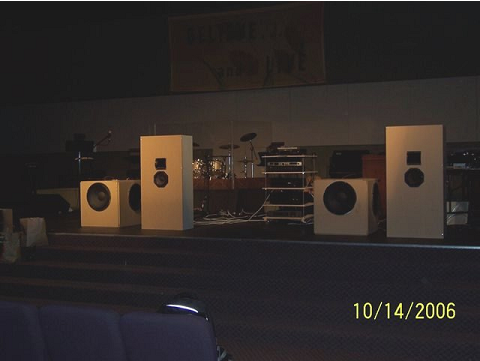 PE metal speaker stands. I drove them with the A308, no bass boost. 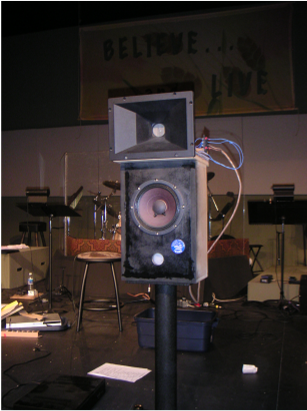 Two-way high-efficiency system with (if I recall correctly) an Eminence Beta-8 woofer and a horn loaded 2-inch throat tweeter. Courtesy of Steve and Rick. 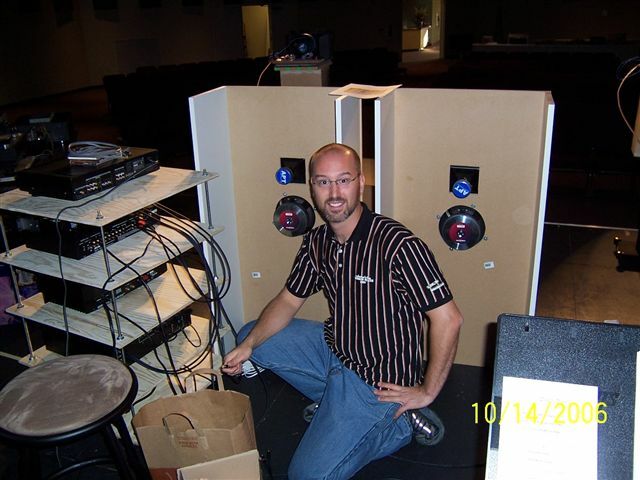 My speaker was a two-way with a Vifa P17SJ-00-08 6.5" LF driver and a North Creek D28-06S 1" dome HF driver and a 1.8kHz 2nd order xover. 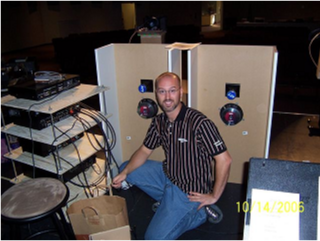 I used both LEAP/LMS and Praxis software with a triple-calibrated ACO Pacific mike system in this project. 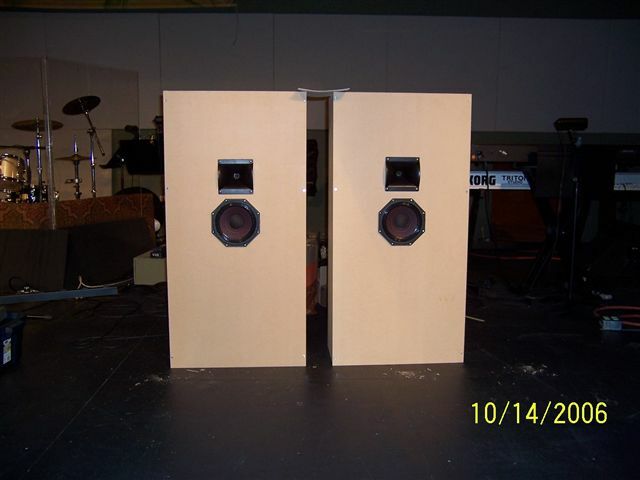 Cabinet and stands were designed and built by yours truly and was the project where I taught myself how to use paper backed veneer for the first time. Although it was the last speaker of the day to be displayed, the few folks remaining who heard it all had pretty good things to say about it and (if I may be allowed to toot my horn a bit) the general feeling was that it was among the best of the day, being quite comparable to Mark K's offering and one said he thought it was even a bit better. 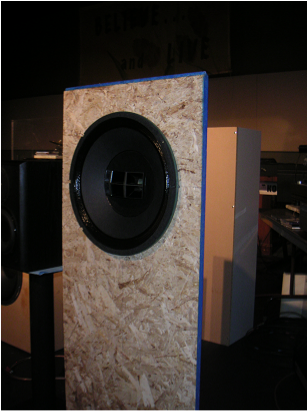 This was my first try and an open baffle system. I just wanted to get something up and running fast so I didn't put too much effort in to woodworking! 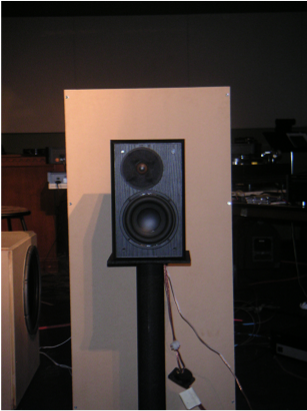 The main panel has an Eminence APT-200 bi-radial horn and a B&C 8PE21 8-inch midrange. The panel measured 24"x48" and wings measuring about 10"x48" were attached to the sides in back. 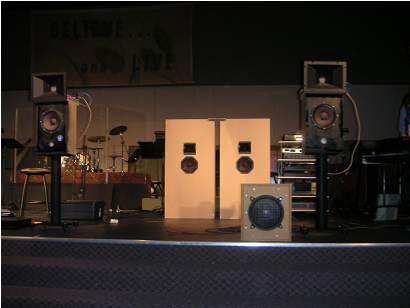 The woofer cubes each used two Eminence Kappa-Lite 3015LF 15" woofers in a compound laoded, passive radiator assisted alignment using two Dayton DVC-385PR 15" passive radiators tuned to about 27 Hz. The cubes were about 5 cubic feet in volume. 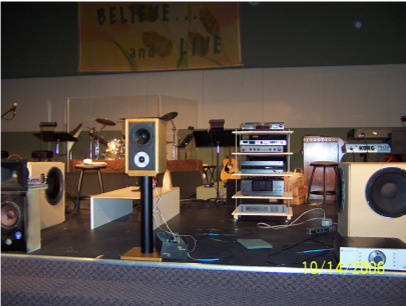 We used the auditorium room of the Roseville Warehouse Ministries Church for this event. We could have sat hundreds of eager DIYers but we managed to get a good showing of about 20 people. Below are pics and some desciptions. 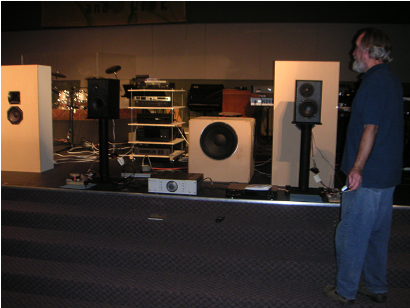 Near the end of the show, Mark K brought a pair of 2-ways using (I think) the Dayton RS 8-inch woofer and the RS-28 tweeter. Don't have a pictures of these but they sounded great. If you can supply some pics to me I will be happy to post them, just click here to contact me.